I didn’t even KNOW I was a Technical Writer. You see, back in 1995, I’d been brought on as a TEMP to answer merger-related email for a bank. When the bank’s Online Customer Service department suddenly faced an external audit, they asked me to document all the internal procedures. A technical writer is a CLARIFIER. We take the complex and make it easy to understand. That’s what we do. That’s who we are. Much has been written of late about the future of Technical Communications. Some speculate that the future is grim – that the profession is fading into the past. While it’s absolutely true that our traditions will have to give way to new methods, I believe our unique skills and abilities matter more today than ever before. I suspect that the manuals we’ve been making matter less every month. But I believe that who we ARE matters more than ever before. We are clarifiers. We receive confusion and deliver understanding. We translate like a protocol droid, from programming languages to basic human communication. We take a tornado of text and turn it into a focussed stream of knowledge. In 2011 and beyond, customer service management professionals will continue to work on standardizing the resolution process and customer service experience across communication channels (e.g., web self-service, chat, email, Twitter, phone). Forrester lists five examples of technical support channels. Of these, four require strong written communication skills. Clear, concise, accurate writing chops are needed to execute all four text-based service channels. What percentage of the people in your company write more effectively, under pressure, than you? Isn’t it fewer than 5%? Even 1%? Don’t be modest. You are amazing at taking complexity, paring it down to what matters, restating it clearly – and in a hurry! Your value isn’t fading. But you need to turn your attention away from the familiar and toward the battle that is actually taking place. You have super powers. You CAN use your powers to address the reality of today’s communication landscape. You see that purple pie slice labeled “self-service” support? That’s YOUR content, today, if you make it available as Search Engine Optimized web topics. Those other text-based channels? They need your skills. I am working with some amazing Information Development teams that are sharing their CLARIFIER super powers with those that own these channels. While most of the attention, training and funding goes toward phone incidents, these represent less than half of total customer interactions today. The money WILL follow the customers. That’s how things work. Don’t lose heart: Find purpose. Don’t look back: Look up and out. You have mad skills. Apply them. You make things make sense: Make that known. Clarify: Help your brand, wherever you can. Another great post, Tristan. It definitely expands and complements the thoughts I expressed in my recent post. Yes, we matter and we do bring the role of clarifier to the table. I also agree that HOW we do that will change and that it is important for all of us to make sure that our skills morph from the traditional methods of delivery to the coming methods. I’ve been banging the drum for a bit that our skills still apply, just in different ways. Always glad to be on the same page with sharp minds like yours! Can’t wait to meet F2F, hopefully in 2011. I graciously accept the compliment of being a sharp mind. 😀 I, too, hope we have an opportunity to meet this year. See there, now I’ve managed to compliment AND complement you, and all in the same day! I’m speaking at STC 11 in Sacramento in May and at Lavacon in Austin in November. Perhaps paths will cross! Great, great post! We need to believe in ourselves and in our unique skills, and you’re pointing the way. Thanks, Tristan! I’d be curious to see what that pie chart looked like, say, 5 years ago — and what it will look like 5 years from now. I suspect that the “phone incidents” piece is getting smaller, and the pieces that require written communication are getting correspondingly bigger. I’ve seen TSIA charts from prior years that are in member-only presentations. The phone channel share is trending down, as you suspect, losing 5-10% share each year. Thanks for your consistent encouragement as we collectively forge our future! Of course nobody wants to call an 800 number, especially when you hear, “Your call is important to us and will be answered in the order in which it was received” for 10 minutes interspersed with some droll music. Then you get connected to someone who needs 5 mintues to find an answer that you’ve already investigated. The frustration level is far too high. Which brings me to another pet peeve: why do support folks who answer the phone assume that we haven’t taken the obvious troubleshooting steps? Why not just ask what we’ve already done and start at that point in their script? Must disagree here. I was recently in a meeting with a bunch of people younger than me. All in their 30s. All are geeks. When I asked this question, to a man (all were men at this meeting) they replied they call the 800 number. First they want help. Second, they like to test the telephone person to see what they know. No one here wants to look stuff up in a manual or guide. They want to speak to someone — fast. I 100% believe your experience represents a subset of users. However, because, I lean toward qualitative data more than anecdotal evidence, I tend to make inferences based on trends more than on interactions. I’m sure that there will always be folks who prefer the phone. But the statistics from multiple source show phone is losing 5-10% of channel share each of the last few years. Voice-based service is decidedly not the primary preference of Gen Y. It’s highly likely that they’ll demand more powerful, self-service options. the Geek” to describe what I did; it still applies. To quote a shiny gold droid, “I am fluent in over 8 million forms of communication, including translation from the geek”. I absolutely think this is a brilliant post. Excellent job of distinguishing between the task (writing technical manuals) and the character – clarifying. Without question, the business world is going to need clarifiers for many years to come. Look at how much information is coming at us on a regular basis! And as for writing, you don’t have to travel long through the blogosphere and Twitter to see that writing is becoming a skill that a lot of people do not pursue. That does NOT mean it’s becoming any less important, however. Thank you so much, Margie. You are quite a “Clarifier” yourself, as I know from reading your insightful posts. As I mentioned on Twitter, you are hereby awarded the honorary Doctorate of Techcomm. Brilliant! Love it. Could not agree more. I’m honored to work with teams like yours in building a “clear” future. I look forward to what we can achieve together for our customers. I plan to take your five actions and put them to practice. 1. Don’t lose heart: Find purpose. 2. Don’t look back: Look up and out. 3. You have mad skills. Apply them. 4. You make things make sense: Make that known. 5. 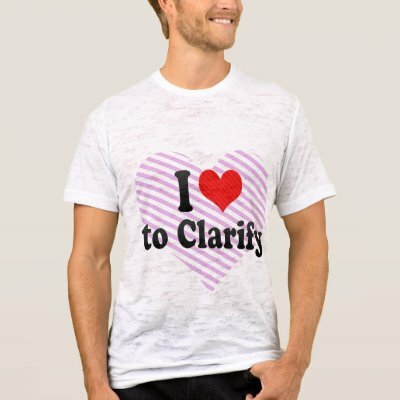 Clarify: Help your brand, wherever you can. I think we constantly need to encourage one another regarding number 3, we are all unique and have skills that others do not have. I like the word “mad”. We need to better appreciate our own value to others. I’m grateful for your response, Bill! We have terrific capabilities that have tremendous value. I can’t wait to watch what you do next! You are WONDERFUL to read because of this! No WONDER I love following your words. They are VERY HELPFUL, NEEDED, & APPRECIATED. I want my life to be better – inner & outer – & you say things so SUCCINCTLY & so ACCURATELY that they go down to my VERY SOUL … (dividing joints & marrow even at SOME points). Grateful for the gift of God in YOU my friend, Tristan.